Two people I knew just died, while living the life they chose, while they were happy. I met one of them in Nosy Be, Madagascar. A sweet golden boy in his twenties, eyes like the ocean, living his youth working in the most beautiful places in the world. I spoke to him once and he told me he was about to leave that kind of life for a “normal” one. I felt sadness in his voice, I felt that it was not an easy choice. The last night he celebrated with his friends. His body was found the day after in the swimming pool of the resort where he used to worked. They don’t know what really happened to him, what I feel is that the island didn’t let him go. I’ve always been an art lover. That kind of art created by human being. I love to take my cappuccino while looking a Michelangelo sculpture in Firenze, reading a book about his life. I never felt the same about Nature. Just the moon and the sea, sometimes, give me peace and an enchantment feeling. Madagascar amazed me in the deepest way. From the first touch I felt true connection with the place, the animals, the tropical atmosphere, the ocean, the Nature. “More than anything, one is struck by the light. Light everywhere. Brightness everywhere. Everywhere, the sun. Just yesterday, an autumnal London was drenched in rain. The airplane drenched in rain. A cold wind, darkness. But here, from the morning’s earliest moments, the airport is ablaze with sunlight, all of us in sunlight”. There’s something about giving up our dreams because of fears or compromises. At the beginning seems like we can survive, we have also being accepted by other people as responsible adult. But the true is that we are intoxicated by an ordinary safe life that slowly becomes excuses, and then torpor, and then insomnia, and then anxiety, and then gloominess. Lastly illness. Knowing you are living the same day everyday for your entire life. Most people don’t really feel because they are scared of changing what they don’t like. It’s comfortable to stay comfortable. But Nature speaks louder. Karma doesn’t care about ephemeral fulfillment. When I was in front of the most beautiful sunset I’ve ever seen, for the first time I felt a true peacefulness. A kind of universal harmony. Nothing to worry about. I can’t remember for how long I stayed with my feet in the Indian Ocean looking at all that beauty all around me, but I slowly realized that my breath had change at the rhythm of the waves and I was subsiding in the sand while exhaling. As if she wanted to keep me there as a root. As if she wanted to make me feel a sense of ancestral belonging, nowadays culturally forgotten. As if she wanted to gently and majestically show me that they are nothing but a fragment of immensity. As if she wanted to remember me who I am and where I come from, in a universal and primordial way I never felt before. As if it wanted to say “Hakuna Matata” (the name of the island in front of me ), life is short, don’t worry about a thing, take it easy. I back to Italy and I start reading about other artists experiences. I found the beautiful journey of Kuki Gallmann with her “I dreamed of Africa” and the interesting analysis of “Jung and Shamanism in Dialogue” by C. Michael Smith. When I said goodbye to Madagascar I left a prayer to the tree of Life, the same kind of ficus where Buddha had his enlightenment.roots. Over 16400 ft of the same tree: his branches fall in the ground giving life to other roots. How infinity we could be if we were deeply connected with the Mother Earth! If you have the chance to be in the middle of this tree, you can feel protection. The branches embrace each other as far as the can see. Nothing bad can happened because we are part of that embrace. The island embraced me with sunsets, animals, the purity of people, and then let me go, asked me to tell about it, to tell about us. We have to make our own life a work of art, that simply means we have to be honest with ourself and our way. And to love the people we choose. And to love our journey. Always. 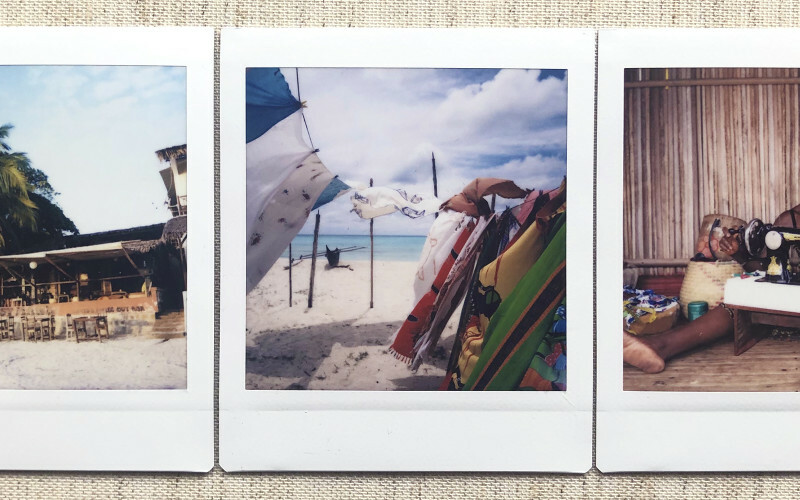 I decided to tell this story through Polaroid (just one click, to celebrate the value of the time ) and InstagramVideo-Stories, (because Nature lives through her sounds, her slow sensuality and her lights). I keep them in my Instagram page, so I can remember everyday.